The Original Donut Shop Keurig Medium Roast Coffee, 72-count, $28.76 shipped (40 cents per k-cup) with Amazon Subscribe & Save. Green Mountain Blend Nantucket Blend Medium Roast Coffee, 72-count, $29.74 shipped (41 cents per k-cup) with Amazon Subscribe & Save. Green Mountain Breakfast Blend Decaf Light Roast Coffee, 72-count, $23.41 shipped (33 cents per k-cup) with Amazon Subscribe & Save. Caza Trail Coffee, Donut Shop Blend, 100-count, $29.74 shipped (30 cents per k-cup) with Amazon Subscribe & Save. Donut House Collection Chocolate Glazed Donut, Keurig K-Cups, 72-count, as low as $32.10 shipped (45 cents per k-cup) with Amazon Subscribe & Save. Keurig Double Donut Breakfast Blend Coffee, 24-count, $9.72 shipped (41 cents per k-cup) with Amazon Subscribe & Save. 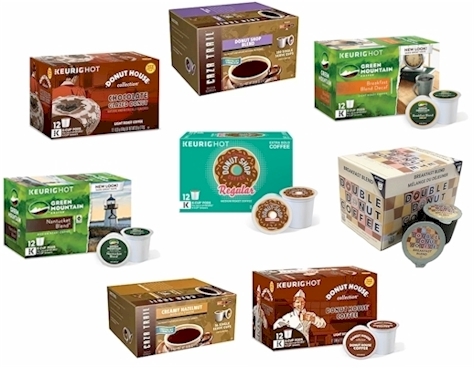 Keurig Donut House Collection Coffee, Keurig K-Cups, 72-count, $32.81 shipped (46 cents per k-cup) with Amazon Subscribe & Save. Caza Trail Coffee, Creamy Hazelnut, 56-count, $20.49 shipped (37 cents per k-cup) with Amazon Subscribe & Save. You can stock up and order multiples of any of these k-cup packs and your Subscribe & Save discount will apply to any quantity that you order.